1. I think, you like many, is missing the point I wanted to bring out. Missing the wood for the trees. 2. You may or may not agree with what Mr Shiv Menon writes. You may not agree with what Prof Mohan Guruswami writes on military domain. He is not for from the Armed Forces. There will be gaps in understanding. On my request Prof Mohan Guruswami has promptly sent his presentation after deleting some slides which may have security connotations. You can view his presentation at http://www.slideshare.net/avidas/india-china-net-assessment-dssc. Like you many have tore into Shiv Menon's talk as many who have gone gaga over it. I am not going to give any judgement, nor is it my intention. One should read other's view point : good, bad or ugly and make one's own opinion. I shall reproduce two responses received to emphasise my point. My point was refusal of Armed Forces to share anything. Two days 'seminar', best in the business, at least from DSSC perspective, gives talk/presentation to officers at the level of Majs. Surely bright as they are, will not understand the complete Gamut. It needs to be disseminated across the board in the Armed Forces. Please tell me would you be able to read these, if I have not got it from Shiv Menon himself and sent. That is the Irony. 3. I am looking for effect of recent Chinese Modernisation of 'PLA' on our Armed Forces. It has to be done by some military professional. The availability of PLA forces in Longzhou or Chengdu Military Regions is known, the airfields, surface, train and other communication means are known, the capability of missiles, space are known. Various arcs, where all they reach are known. People from the civilian background is asking question what are you doing. One civilian recently asked me : As per % of GDP on expenditure of defence we are at the lowest below 2%, with Pay Commission, OROP revenue expenditure has shot up, no money for weapon, eqpt, amn. Do you really need Mountain Strike Corps, can you sustain that with the kind of funds available. What kind of reorg armed forces can undertake. Do Indian Army need to change their war fighting doctrine against Chinese, etc etc etc. 4. Where is that Chinese expert from Indian military who is writing on these issues. Recently I attended a seminar at ORF on Modernisation of PLA. Manoj Joshi had published on Op Edit, he spoke also. Nothing new. Our ack expert on China, Ex DA presently Comdt, AWC; on the verge of retirement gave a far better presentation. But the Indian connection, analysis was missing. Information is available, see Jamestown Foundation China Brief, CSIS Papers , Rand Reports or my vey own China page in my blog. What is critical and important is analysis. We can keep criticising others BUT where are we. That is the point I repeatedly try to hammer into. I have heard that vendor Ashley Tellis in a seminar at USA giving a far better view on effect of Chinese military modernisation on Indian Armed Forces. I have nothing against Ashley Tellis, he is looking after US interest, India is the big defence eqpt market, he is now propagating India should purchase A110 Warthrog! What irritates me is we Indians fawn over him. 5. You can analysis only when you read! That is why I have been advocating distribution of knowledge. Kindly click on DSSC website in Internet. You will get photographs and monthly newsletter. So many foreign officers are being trained there. The Govt is spending so much money. Can't you be more professional. I have been telling since donkeys years for sharing presentations/thesis, there is nothing classified about it. If you go to Dissertation page of my knowledge on line website @ http://indianstrategicknowledgeonline.com/index.php?t=Dissertations you get 450 thesis from Armed Forces War Colleges of Western origin. Our officers who became Chiefs/C-in-Cs, their dissertations while undergoing course abroad, I had put. But our DSSC/AWC/refuses to do. NDC, at the top of the value chain, who does not come under anybody, MoD does not care, can do whatever it feels like, does not budge. Not because lack of effort from my side, I can guarantee you that. Cat 'A' ests with so much resources and infrastructure refuse to do which an One Man Army has shown what can be done. It is not that, people at the helm of affairs don't know. One of the Ex GOC-in-C ARTRAC sent me a book authored by him on his achievements replete with very good photographs including his horse riding, attending parties etc. These were given to every Gentlemen Cadets passing out from IMA and OTA. He wanted some good words to be written about the book. Some good words quoted in the book were from a veteran two star, which I suspect, I may be wrong, was from his father. The other one was from a well respected veteran, who probably out of decency or may be looking from some invite from ARTRAC sponsored event gave some encouraging words. 1. Recently a two day seminar on "Economic and Security Dimensions of India-China Relations." was organised by Defence Services Staff College, Wellington. There was a galaxy of speakers. Shri Shiv Shankar Menon, Ex NSA delivered the opening address and Prof Mohan Guruswami the valedictory address. 2. Armed forces are great event managers. They go to the minutest details, conduct the events with lot of pride and finesse and I am sure the seminar was a grand success. Great, good job done. 4. Those of you who have been receiving my mails for so many years will agree with me how fanatically I have been propagating the need for distribution of knowledge. Our people, senior officers after retirement will write some "gambhir" paper on Professional Military Education (PME). Where is the education? It is all training. Our senior officers would never write in professional military journals except just before retirement or when ordered to do so. Why should one stick his neck out. Jo bole kunda Khole, If you don't write or speak you commit no mistakes. Zero error syndrome at its very best. Better to discuss back nine performance of you boss at the golf course. You go to the golf course at 3, come back dog tired, attend evening social engagements. Where is the time for professional, military reading or PME. Time Nehi Deda. 5. While in service I have tried my very best on this issue . It was at spectacular failure. I have been very very sarcastic and acidic. One of the former Service Chief and Chairman CSOC, whom I consider was the only one suitable for becoming NSA, whom I hold in great esteem, got very hurt by my scathing writings on this issue. He wrote to me that my job is to make water available to the horses. Whether they drink or not is none of my business. Similarly somebody wrote, people will read whenever they require. You don't have to show you knowledge, we have no time. Fair enough. 6. I have done all these, while in uniform. After retirement I have no business to write like this. People will say, you are Ex, what do you know what happens now. Rightly so. While writing these acerbic, acidic comments I generate lot of negative energy/vibration, body gets plenty of toxic material. This is not good for my health and mind. Now I should try to do yoga, meditation, Bipsana and what have you and imbibe essence of Bhagwat Gita. "Whatever happened in the past, it happened for the good; Whatever is happening, is happening for the good; Whatever shall happen in the future, shall happen for the good only. Do not weep for the past, do not worry for the future, concentrate on your present life." I say Amen to that. 7. Yesterday I met Shri Shiv Shankar Menon, our Ex NSA at Carnegie India's inauguration function. I requested him for a copy of his speech. Immediately he took out his phone and e-mailed to me. He also said, Prof Mohan Guruswami made an excellent presentation. He had carried out a net assessment type of thing on China. I am requesting Prof Mohan Guruswami to send me his presentation. Shri Menon told me these have been given to DSSC. I could not tell him that they will never share. * Look Out, China: India Wants a New Aircraft Carrier—With Help From U.S.
Parrikar, for his part, reiterated India’s desire for greater collaboration on areas of high-technology where New Delhi can benefit from the American know-how. The government is approaching the home stretch in a historic reset of the India-Iran relationship. Two senior cabinet ministers are heading for Tehran this month. Petroleum Minister Dharmendra Pradhan will visit Tehran on April 9-10, to be followed within a week by the External Affairs Minister Sushma Swaraj on April 16. Conceivably, it isn’t too early to begin pondering about a landmark visit by Prime Minister Narendra Modi to Iran. A historic visit seems to be in the making. If things work out, it will be a great leap forward in the Indian-Iranian economic ties in the new phase of Iran’s reintegration with the world market following the lifting of sanctions. There can be no two opinions that economic partnership is the cornerstone of an enduring India-Iran reset in the 21st century. Both countries’ leaderships attach high importance to the development of the economy in their respective national agenda. Significantly, within no time Swaraj proposes to follow up on Pradhan’s talks in Tehran and endeavour to give an overarching political direction to the new emergent impulses of strategic partnership. One can well anticipate that a top agenda item the Iranian leadership will bring forward as talking point with Swaraj will be an early visit by PM Modi to Iran. Possibly, Swaraj’s mission could be to firm up Modi’s visit and prepare the ground for it. This brings to the fore a consistent trait in the Iranian diplomacy, namely, its marvelous capacity to view life as a many-splendoured thing and to never reduce relationships to zero sum terms. Unlike Israel or Saudi Arabia – or the US in a bygone era – Iran has no problem if India maintains diversified relationships in the Persian Gulf region (or anywhere else in the Middle East.) There is no paranoia in the Iranian mind that Israel sells a lot of high-technology weapons to India or that Saudi King Salman has conferred the Abdulaziz Sash on Modi. Our pundits have a long way to go to appreciate the subtleties and sophistication of the Persian mind. Another aspect to be kept in mind is that India should not waste its breath too much on the containment of Pakistan. It is simply not worth our while. The Iran-Pakistan relationship has been a deeply flawed one all along for a variety of reasons. Admittedly, the atmospherics has distinctly improved of late but a relationship of genuine trust and mutual confidence will take a very long time to develop, the reason being Pakistan’s historical role as Saudi Arabia’s sidekick in the region. Trust the Saudis to put a spoke in the wheel whenever the Pakistan-Iran ties show signs of looking up or to summon their influence with the Pakistani generals to continue to make attempts to foster terrorism and destabilize Iran’s eastern regions bordering Pakistan’s Baluchistan. A complete break from this pattern is unlikely anytime soon – that is, until and unless the tensions in Saudi-Iranian relations ease. No doubt, this is also a pattern that Pakistan’s political class can easily jettison. Things were probably better while Benazir Bhutto was in power but that was an exception for obvious reasons. Nawaz Sharif may have permitted the trial of Jaish-e-Mohammed terrorists for the Pathankot attack. But this fell apart because of General Raheel Shareef's keenness to make Kulbhushan Jadhav the centerpiece of global attention. Ambassador G Parthasarthy, a former Indian high commissioner to Pakistan, reveals the Pakistan army chief's gambit against India. Ever since 'Indian spy' Kulbhushan Jadhav appeared on Pakistan television screens in Pakistani military custody, the generals in Rawalpindi have been jumping around excitedly, to get India condemned, for allegedly backing terrorism in Pakistan. They have, however, only succeeded in bringing more grief to their country's already low international credibility, resulting from its denial of being a State sponsor of terrorism. They have, for years, also been looking for a 'smoking gun' to establish that India is a State sponsor of terrorism in Pakistan. In attempting to do so, they have shot themselves in the foot all too often. Pakistan's de facto ruler, General Raheel Shareef, chose not to be present when Prime Minister Nawaz Sharif met visiting Iranian President Hassan Rouhani. He separately met President Rouhani, swagger stick in hand, the next day. The obedient army spokesman dutifully tweeted that his exalted boss had given evidence to the Iranian president about the evil Indians using Iranian soil to destabilise the exalted Islamic Republic of Pakistan. An obviously irritated President Rouhani bristled with anger, when he was asked about this, noting that India, like Pakistan, was regarded as a friendly country, by Iran. The Iranian embassy reiterated this a few days later. Pakistan now faces a dilemma. Anything Jadhav says while in Pakistani custody will be brushed aside as being made under coercion. If the Pakistan military releases him, he could well point out some unpleasant truths about Pakistan. Finally, if indeed he is a R&AW agent, he would not have been so dumb as to enter Pakistani territory, and more so its volatile Balochistan province, when he could operate comfortably from Iran, or elsewhere. Pakistan's ludicrous behaviour has been heightened after it found its credibility in the Arab world sinking. Prime Minister Modi's visit to Saudi Arabia signaled a further erosion of its influence, in what Pakistan has historically felt, was its backyard -- the Gulf region. Pakistan had certainly not bargained for, or envisaged a situation, when Saudi Arabia and its Arab Gulf neighbours would be cooperating actively with India, in dealing with Islamic radicals and seeking enhanced security cooperation with New Delhi. This is happening, despite the fact that Mian Nawaz Sharif has personally been the recipient of Saudi patronage and protection, for decades. The worst kept secret today in Pakistan is that the country's elected prime minister and its overbearing army chief loathe each other. This is more so, after the army unilaterally commenced operations across the Punjab province -- the heartland of Nawz Sharif's political power -- without bothering to take the prime minister's approval. While Sharif could countenance the army unilaterally acting in the Khyber Pakhtunkhwa province, bordering Afghanistan, he realises that he must look silly in the eyes of his Punjabi brethren when the army acts similarly in Punjab, on the very day that bomb blasts took a heavy toll of life in the Punjab capital, Lahore. It is not surprising that these developments have inevitably cast a shadow on the already strained and complex relations with India. Nawaz Sharif himself has a record of links with organisations like the Lashkar-e-Tayiba. But he has no particular affection for southern Punjab Deobandi groups like the Jaish-e-Mohammed. It is for this reason that Nawaz Sharif appeared more than forthcoming in responding to India's request for action against the Jaish-e-Mohammed, led by Masood Azhar, the mastermind of the December 13, 2001 attack on India's Parliament. While it would have been difficult -- if not impossible -- for the ISI to hand over Azhar to India, his foot soldiers could always have been treated as expendable and tried in Pakistan. But all this fell apart because of Raheel Shareef's keenness to carry forward his ideas to establish a kangaroo court, to make Kulbhushan Jadhav the centerpiece of global attention. What they, however, failed to note was that Basit was actually intending to get across the views of his patrons in the Pakistan army's GHQ about the 'evil R&AW agent' Kulbhushan Jadhav. Basit, like many other Pakistani diplomats, must be following the prudent procedure of acting according to the political winds in Islamabad and the army's GHQ in Rawalpindi. And Basit, like his colleagues, must have noted that the political winds today are in favour of the general in Rawalpindi, rather than the prime minster in Islamabad. What does all this foretell for the future? It seems clear that while Nawaz Sharif recognises the need to be seen as being reasonable in dealing with India, General Shareef has other priorities. Nawaz also has other facets to his personality. He realises that Prime Minister Modi has expended considerable political capital by reaching out personally to him. He will have to host a very sparsely attended SAARC Summit in Islamabad later this year if the Indian prime minister acts difficult and makes his displeasure and grievances evident at the summit, especially if Pakistan is seen to be not acting reasonably on the Pathankot attack. These are issues of secondary importance to General Raheel Shareef, for whom the strategy of how to take advantage of Kulbhushan Jadhav being in his custody needs to be the focus on continuous and indeed exclusive attention. India needs to play it cool in the light of these developments. 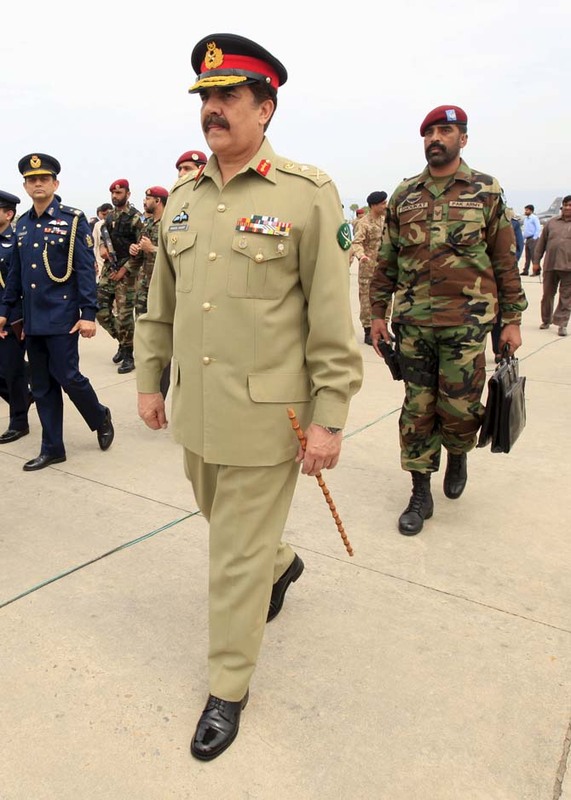 General Shareef calculates that given China's continuing support, Pakistan and the ISI have nothing to worry about on the possibility of UN Security Council action against Masood Azhar. He will have the assets of Muhammed Saeed and Masood Azhar ready for crossing the LoC when the Himalayan snows melt in July. He also evidently believes that the Obama administration is not likely to do anything substantial to put the squeeze on Pakistan to bring the perpetrators of the Pathankot attack to book. Can New Delhi change these dynamics of American and Chinese policies anytime soon? Realists like this writer will be quite sceptical on this score. Despite this, it serves India's interests quite well to keep persevering with moves that keep Pakistan on the defensive on issues of terrorism, while focusing attention on what Pakistan is doing in promoting radical terrorists outfits for use in both India and Afghanistan. New Delhi would do well to counter efforts by Pakistan and China to contain it, by more proactive military cooperation with neighbours on the land and maritime borders of both these countries. With the retirement pace fast exceeding the replacement rate, the Indian Air Force faces an ageing aircraft fleet. Shortfalls in squadron strength apart, the IAF is plagued by a long list of ailments reflective of bad planning which is adversely impacting India’s air- power capability. Indian Air Force''s AWACS (airborne warning and control system) landing at a forward base after a successful mission during an exercise. An “eye in the sky” & a major force multiplier, the AWACS is under-utilised even seven years after its induction in the IAF. PTIThe fighter squadron strength of the Indian Air Force (IAF), the world’s fourth largest, has fallen to 33, nine short of the sanctioned strength of 42.Translated in numbers, the shortfall works out to 144 aircraft; 162 if the trainer version is included. This declining strength has understandably led the IAF to publicly acknowledge that fighting a “two-front collusive war” (with China and Pakistan) has resultantly become difficult. Ideally, the IAF would like to expand its fighter fleet to 45 squadrons to be able to fight a two-front war. Instead, the worst is yet to come with the projected decline expected to touch a low of 25 squadrons by 2022, which is just six years away. Reason: the retirement pace of the IAF’s ageing aircraft fleet is fast exceeding the replacement rate. And yet ironically, at the same time, the IAF’s fighter pilot-to-cockpit ratio has declined to less than one pilot per aircraft (0.84) against a sanctioned strength of 1.25 in contrast to 2.5 of the Pakistani Air Force. Thus the IAF is afflicted by both lesser fighter aircraft and a pilot shortfall. But the story does not end here. If an action or policy has a suspected risk of causing harm to the public, or the environment, the burden of proof that it is not harmful falls upon those taking such action or implementing such policy." The Precautionary Principle quoted above has guided international agreements like the Kyoto Protocol. It applies when making policy about climate change, genetically modified food, public health, etc. The principle also applies to nuclear energy. A nuclear accident may have terrible consequences. 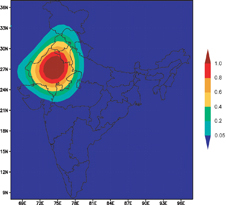 Apart from causing death, radiation can render large areas uninhabitable. Running a reactor involves storing lethal radioactive waste for centuries, and decommissioning a reactor is also tricky and dangerous. Most nations cut back on nuclear power after the 2011 Fukushima incident. Japan shut down all reactors, although 30 per cent of its power came from nuclear at the time. (It is now considering reopening some plants.) Germany will totally shut down its nuclear plants by 2022. France will reduce dependence on nuclear to 50 per cent of generation by 2025, down from the current 75 per cent. India, on the other hand, will vastly expand capacity. Political commitment for this is strong. Manmohan Singh risked his government's future when he pushed the Indo-US Civil Nuclear Agreement in 2008. The Left Front withdrew support to the United Progressive Alliance in its first term as a direct result. The Bharatiya Janata Party is also pro-nuclear. The logic for expansion isn't obvious. Nuclear is touted as clean (assuming there are no accidents). But power from the planned new capacities will be expensive compared to renewables, which carry much less risk and can be installed much quicker. India will also depend on uranium-based fuel imports, leaving it hostage to diplomatic pressures. The new capacities will be uranium-fuelled. India already needs fuel imports to keep current capacity running. 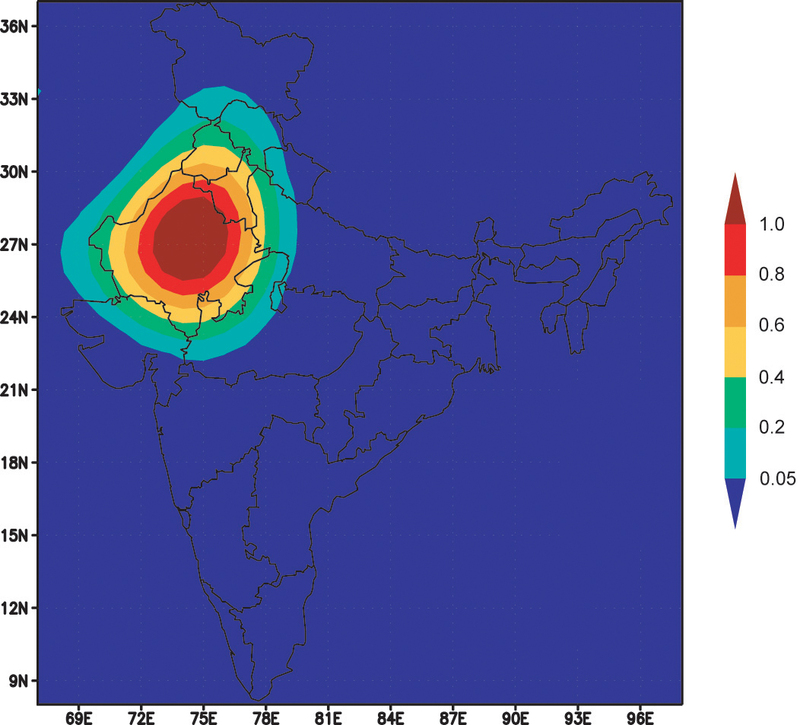 While India has ample thorium, it is at least a decade away from serious thorium-fuelled capacity. India has 5.8 gigawatt (Gw) of capacity, which contributes almost three per cent of total generation. It targets 14.8 Gw by 2021 and 27.5 Gw by 2032, with 25 per cent of generation by 2050. Six reactors are under construction, 36 more are planned. Companies such as EDF-Areva, Toshiba-Westinghouse, GE Hitachi and Rosatom will supply reactors and related equipment. India has 21 operational plants. There have been several minor accidents over the years, the most recent one being a coolant leak at the Kakrapar reactor in Gujarat, which led to a shutdown for over two weeks in March. That was Level 2 on the International Nuclear and Radiological Event Scale (Ines), which is one level below "Serious". 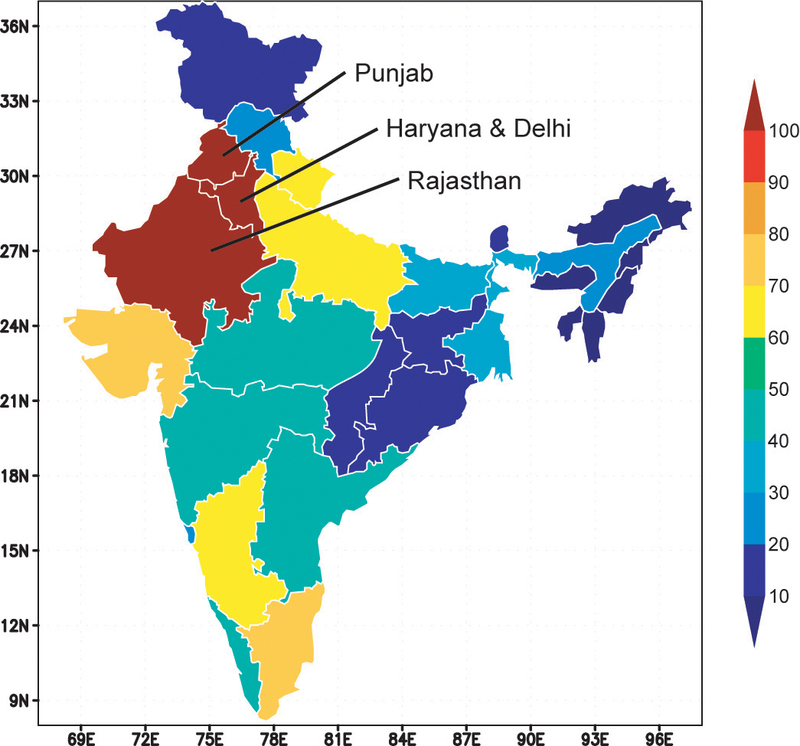 › Larger imageBeneath northern India’s irrigated fields of wheat, rice, and barley ... beneath its densely populated cities of Jaiphur and New Delhi, the groundwater has been disappearing. Halfway around the world, hydrologists, including Matt Rodell of NASA, have been hunting for it. Where is northern India’s underground water supply going? According to Rodell and colleagues, it is being pumped and consumed by human activities -- principally to irrigate cropland -- faster than the aquifers can be replenished by natural processes. They based their conclusions -- published in the August 20 issue of Nature -- on observations from NASA’s Gravity Recovery and Climate Experiment (GRACE). 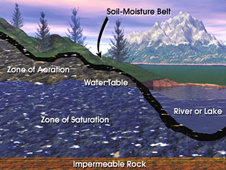 "If measures are not taken to ensure sustainable groundwater usage, consequences for the 114 million residents of the region may include a collapse of agricultural output and severe shortages of potable water," said Rodell, who is based at NASA’s Goddard Space Flight Center in Greenbelt, Md. 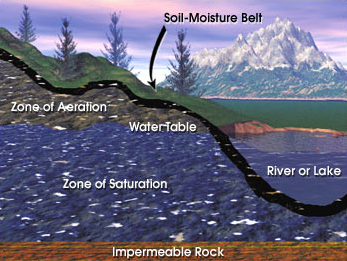 Groundwater comes from the natural percolation of precipitation and other surface waters down through Earth’s soil and rock, accumulating in aquifers -- cavities and layers of porous rock, gravel, sand, or clay. In some of these subterranean reservoirs, the water may be thousands to millions of years old; in others, water levels decline and rise again naturally each year. NEW DELHI, April 8 India is in talks with the United States to purchase 40 Predator surveillance drones, officials said, a possible first step towards acquiring the armed version of the aircraft and a development likely to annoy Pakistan. India is trying to equip the military with more unmanned technologies to gather intelligence as well as boost its firepower along the vast land borders with Pakistan and China. It also wants a closer eye on the Indian Ocean. New Delhi has already acquired surveillance drones from Israel to monitor the mountains of Kashmir, a region disputed by the nuclear-armed South Asian rivals and the cause of two of their three wars. As defence ties deepen with the United States, which sees India as a counterweight to China in the region, New Delhi has asked Washington for the Predator series of unmanned planes built by privately-held General Atomics, military officials said. “We are aware of Predator interest from the Indian Navy. However, it is a government-to-government discussion,” Vivek Lall, chief executive of U.S. and International Strategic Development at San Diego-based General Atomics, told Reuters. The U.S. government late last year cleared General Atomics’ proposal to market the unarmed Predator XP in India. It was not clear when the delivery of the drones would take place. The navy wants them for surveillance in the Indian Ocean, where the pilotless aircraft can remain airborne for 35 hours at a stretch, at a time when the Chinese navy is expanding ship and submarine patrols in the region. Moves by India to enhance its defence capabilities have in the past provoked sharp reactions from Islamabad, where the government and military are worried about falling further behind their bigger rival in the arms race. Pakistan’s foreign ministry could not be reached for comment on Friday, the start of the weekend there, while the military had no immediate comment. On 8 April, RSS ideologue Rakesh Sinha, who represents the RSS and defends BJP’s policy towards Pakistan and Jammu & Kashmir on a daily basis in TV debates debunked the assertion of Major General (Retd) G D Bakshi that “there is no change in the Pakistan’s policy towards India as far as Jammu & Kashmir is concerned” and that “it would be suicidal for the bleeding India to pin faith in unscrupulous and rogue Islamabad”. Rakesh Sinha emphasised and reemphasised that “there is a sea change in the Pakistan’s attitude towards Jammu & Kashmir” and to make his point he said that “the Pakistan’s political parties didn’t make Jammu & Kashmir an election plank in the 2013 Pakistan National assembly elections” (“Sab Se Bada Sawal”, News 24, April 8, 2016). Rakesh Sinha, it seems, is blissfully ignorant about what the various political parties of Pakistan said in their respective election manifestos about their stand on Jammu & Kashmir. Had he or any other RSS ideologue cared to monitor the 2013 general elections in Pakistan, they would not have said what Rakesh Sinha Sinha said to counter Major General (Retd) G D Bakshi. The truth, in fact, is that political parties in Pakistan around the 2013 elections had turned so hostile towards India that they had included Jammu & Kashmir in their respective election manifestos very prominently. The election was held on 11 May, 2013. One of their major election planks was this part of Jammu & Kashmir. The people of Pakistan-occupied Jammu & Kashmir (POJK), including the Shiite Muslim-dominated Gilgit-Baltistan, which has become the hub of anti-India activities being indulged in by both Pakistan and China for decades now to weaken India’s position on the strategic northern frontiers, is a region of non-Kashmiri-speaking people. AT 2pm in the tiny African state of Djibouti everything stops. As the sun burns high in the sky people retreat to their homes, save for a few men lying in the shade of colonial-era walkways, chewing qat leaves that bring on a hazy high. In the soporific heat you would be forgiven for thinking that time had forgotten the New Jersey-sized nation. Yet its quiet stability within the volatile Horn of Africa has made the country of just 875,000 people a hub for the world’s superpowers. The stars and stripes flutters alongside the runway where military and passenger planes touch down: Camp Lemmonier, America’s only permanent military base in Africa, hosts 4,500 troops and contractors who conduct missions against al-Qaeda in Yemen and al-Shabab in Somalia. The outpost, leased for $60m a year, shares an airstrip with the international airport, although its drones now fly from a desert airfield eight miles away after one crashed in a residential area in 2011. Djibouti also hosts France’s largest military presence abroad (it still has an agreement to defend its former colony); Japan’s only foreign base anywhere; and Spanish and German soldiers from the EU’s anti-piracy force, who are billeted at the fancy Kempinski and Sheraton hotels. The Saudis and Indians are also rumoured to be interested in establishing outposts, as are the Russians. Meanwhile, China is building its first overseas base anywhere in the world in Djibouti, for which it will pay a more modest $20m in rent annually. It is supposedly nothing more than a logistics hub for anti-piracy operations and evacuating citizens from hotspots like Yemen, just 20 miles away across the Bab el-Mandib strait. Some Western officials fear that China may have bigger plans, however. It might in the future be awkward to have countries that do not always see eye-to-eye running military operations out of the same crowded space. The tiny desert state wants to be more than a superpowers’ playground, though; it has ambitions to become a Dubai or Singapore at the gateway of the Red Sea and Indian Ocean. “We don’t have anything else but location,” says Robleh Djama Ali, the head of business development at the Djibouti Ports and Free Zone Authority. The country’s lack of natural resources may be coincidental, but its fortuitous geography, wedged between Eritrea, Ethiopia and Somalia, is no accident. France wanted a port to rival Aden, Britain’s colony on the other side of the Red Sea. It has been desirable more recently too. The terrorist attacks of September 11th, 2001 brought the American military. Somali pirates brought EU soldiers. The Ethiopia-Eritrea war from 1998 to 2000 robbed Ethiopia of access to its smaller neighbour’s ports. 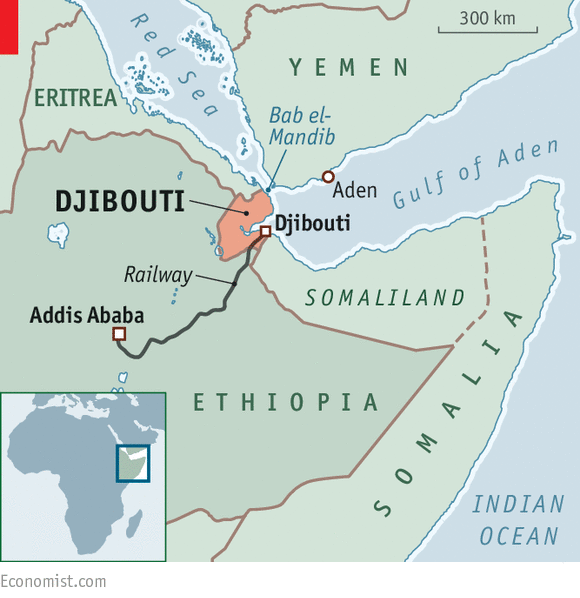 Now 90% of Ethiopia’s imports come through Djibouti, accounting for 90% of its ports’ traffic. Ethiopia’s double-digit growth over the past decade has rubbed off on Djibouti. Around $9.5 billion of energy and infrastructure projects are under way, including four more ports, two new international airports and two pipelines, and a railway to Ethiopia (the last, ministers promise, is due to open within weeks). Another $9.7 billion of proposals are as yet unfunded. To put this in perspective, Djibouti’s GDP was just $1.6 billion in 2014. China is the biggest investor, much of it via soft loans. Officials won’t say exactly how much they are in hock to the Chinese, but both the IMF and African Development Bank have warned about its public debt, which is projected to balloon from 60.5% of GDP in 2014 to 80% in 2017. The finance minister, Ilyas Moussa Dawaleh, isn’t concerned: “what we are getting from China is much more important than any other long-standing partner,” he says. The boom has not benefited everyone. The ports account for a whopping 70% of GDP, but only provide a few thousand jobs. The UN puts unemployment at 60%, though Mr Dawaleh claims it is half that (Djibouti’s data are dodgy). Illiteracy runs at about 45%. The lack of employment is offset by traditional support systems; one worker can support an entire extended family. So the government can buy the loyalty of, say, 30 people by hiring a single bureaucrat. Dissent still simmers. Opposition figures claim police killed 19 people at a religious celebration in December 2015 (the government says only seven died). A corruption case brought by the government against Abdourahman Boreh, a wealthy businessman who was President Ismael Omar Guelleh’s right-hand man until he questioned his plan to run for a third term in 2011, was thrown out by a British High Court at the start of March. The country is voting on April 8th, but the re-election of Mr Guelleh for his fourth presidential term is a foregone conclusion; the opposition, an unwieldy coalition of seven parties, is fielding two rival candidates. Recently, Nepal and China signed ten agreements, including on trade and transit, transportation, energy, and supply of oil from China to Nepal. The country’s ruling elites have hailed the agreements as a major breakthrough in Nepal-China relations. But the people on the ground are highly sceptical and are apprehensive about its unwanted impact on socio-economic and security situation of the country. At the time of political instability, the growing controversies over the issue are a matter of concern for the common Nepalese people. By signing trade and transit agreement with China, Nepal has got right to access to the Chinese sea port in Guangzhou. With this development, the country will now be able to trade with third countries through this port. Hitherto, Nepal had to rely solely on Kolkata port of India for the purpose. However, the distance between Nepal and Guangzhou port is over 3,000 kilometres, which is more than three times the distance between Nepal and Kolkata port. It is, therefore, likely that the time and transport cost of carrying goods between Nepal and Guangzhou would be exorbitant. Hence, it is doubtful if any sensible business persons would ever think of doing trade with China or with third countries via the Guangzhou port when they have every option available to do the same via Kolkata port. Moreover, Kolkata port is already connected with Birgunj Dry Port of Nepal through the Indian Railway network, while the Chinese port of Guangzhou does not have proper roadways to connect to Nepal. This is one of the major factors why bulk of Nepal’s trade even with China is not carried out through the land route between Nepal and Tibet but through the Kolkata port. Additionally, none of the trade points between Nepal and Tibet at present is in operation. The Tatopani-Khasa trade point has been closed for a year. Road connecting this place with Kathmandu was severely damaged during the deadly earthquake of April 25 last year in Nepal, and it is yet to be re-constructed. Another trade point of Kerung-Rashuwagadhi is in bad condition. It is full of risk to ply transport services on it. So-called gray zone wars are not new, but they have highlighted shortcomings in the way the West thinks about war and strategy. This monograph proposes an alternative to the U.S. military's current campaign-planning framework, one oriented on achieving positional advantages over rival powers and built around the use of a coercion-deterrence dynamic germane to almost all wars as well as to conflicts short of war. For the foreseeable future, deterring and countering near-peer adversaries such as Russia and China will undoubtedly remain at the forefront of American grand strategy. But in addition to meeting the challenges associated with traditional and well-known state-based threats, the U.S. military will be expected to combat an array of violent non-state actors — a blanket term that includes well-established groups like Islamic State, al Qaeda and the transnational criminal gang MS-13 but also countless other and less well-known militias, insurgent groups and terrorist organizations. Countering violent non-state actors will almost assuredly force the U.S. military to engage in operations in or on the edge of densely populated “megacities,” urban areas that seep into one another and have more than 10 million inhabitants. This is problematic. Military missions even in relatively small built-up areas are inherently complex endeavors. Buildings and masses of people can provide cover and concealment to hostile actors and their operations. These features can also reduce the effectiveness of the intelligence, surveillance, and reconnaissance platforms the military needs to successfully conduct operations. The larger and more complex the city, the more pronounced these challenges become. Popular conceptions of megacities are drawn from the futuristic and dystopian stories often presented in science fiction. The urban sprawl and enormous concentration of people was depicted in the 1995 film “Judge Dredd,” where a megacity is the locus of crime and armed gangs, and a host of social ills run rampant. While a single metropolis extending from Boston to Washington, D.C., or from San Francisco to San Diego might seem far-fetched, megacities do exist and are only expected to become more common. In 2015, 27 regions worldwide fit the definition of megacity but projections by the National Intelligence Council suggest that over the next decade and a half, urban growth will result in more than a dozen more, with many of them in Africa and Asia. Because of the sheer size of megacities and the challenges associated with their governance, some of these urban redoubts will likely be characterized by areas of lawlessness and sizable “no-go zones,” making them ripe targets for violent non-state actor recruitment and funding activities. In such areas, these actors will be able to create and/or take advantage of black markets, shadow governance, illicit economies and dark networks to generate revenue and recruit new members over long periods. From the beginning, many and probably most liberal policy wonks were skeptical about Bernie Sanders. On many major issues — including the signature issues of his campaign, especially financial reform — he seemed to go for easy slogans over hard thinking. And his political theory of change, his waving away of limits, seemed utterly unrealistic. Many analysts concluded years ago that the answers to both questions were no. Predatory lending was largely carried out by smaller, non-Wall Street institutions like Countrywide Financial; the crisis itself was centered not on big banks but on “shadow banks” like Lehman Brothers that weren’t necessarily that big. And the financial reform that President Obama signed in 2010 made a real effort to address these problems. It could and should be made stronger, but pounding the table about big banks misses the point. Yet going on about big banks is pretty much all Mr. Sanders has done. On the rare occasions on which he was asked for more detail, he didn’t seem to have anything more to offer. And this absence of substance beyond the slogans seems to be true of his positions across the board. Shifting money from offshore secrecy havens to the U.S. has become a brisk business for Rothschild & Co. One Turkish client is moving assets from the Bahamas to Nevada. Share on LinkedInShare on RedditShare on Google+E-maiLast September, at a law firm overlooking San Francisco Bay, Andrew Penney, a managing director at Rothschild & Co., gave a talk on how the world’s wealthy elite can avoid paying taxes. Featured in Bloomberg Businessweek, Feb. 1, 2016. Subscribe now. Photo Illustration: Justin Metz for Bloomberg Businessweek; Reno: Matt Licari/Gallerystock After years of lambasting other countries for helping rich Americans hide their money offshore, the U.S. is emerging as a leading tax and secrecy haven for rich foreigners. By resisting new global disclosure standards, the U.S. is creating a hot new market, becoming the go-to place to stash foreign wealth. Everyone from London lawyers to Swiss trust companies is getting in on the act, helping the world’s rich move accounts from places like the Bahamas and the British Virgin Islands to Nevada, Wyoming, and South Dakota. The U.S. “is effectively the biggest tax haven in the world” —Andrew Penney, Rothschild & Co.The firm says its Reno operation caters to international families attracted to the stability of the U.S. and that customers must prove they comply with their home countries’ tax laws. Its trusts, moreover, have “not been set up with a view to exploiting that the U.S. has not signed up” for international reporting standards, said Rothschild spokeswoman Emma Rees. Why the Wealthy Are Moving Their Money Into the U.S. Rokahr and other advisers said there is a legitimate need for secrecy. Confidential accounts that hide wealth, whether in the U.S., Switzerland, or elsewhere, protect against kidnappings or extortion in their owners’ home countries. The rich also often feel safer parking their money in the U.S. rather than some other location perceived as less-sure. No one expects offshore havens to disappear anytime soon. Swiss banks still hold about $1.9 trillion in assets not reported by account holders in their home countries, according to Gabriel Zucman, an economics professor at the University of California at Berkeley. Nor is it clear how many of the almost 100 countries and other jurisdictions that have signed on will actually enforce the new disclosure standards, issued by the Organisation for Economic Co-operation and Development, a government-funded international policy group. There’s nothing illegal about banks luring foreigners to put money in the U.S. with promises of confidentiality as long as they are not intentionally helping to evade taxes abroad. Still, the U.S. is one of the few places left where advisers are actively promoting accounts that will remain secret from overseas authorities. Illustration: Steph Davidson Rothschild’s Reno office is at the forefront of that effort. “The Biggest Little City in the World” is not an obvious choice for a global center of capital flight. If you were going to shoot a film set in Las Vegas circa 1971, you would film it in Reno. Its casino hotels tower above the bail bondsmen across the street, available 24/7, as well as pawnshops stocked with an array of firearms. The pink neon lights at casinos like Harrah’s and the Eldorado still burn bright. But these days, their floors are often empty, with travelers preferring to gamble in Las Vegas, an hour’s flight away. The offices of Rothschild Trust North America LLC aren’t easy to find. They’re on the 12th floor of Porsche’s former North American headquarters building, a few blocks from the casinos. (The U.S. attorney’s office is on the sixth floor.) Yet the lobby directory does not list Rothschild. Instead, visitors must go to the 10th floor, the offices of McDonald Carano Wilson LLP, a politically connected law firm. Several former high-ranking Nevada state officials work there, as well as the owner of some of Reno’s biggest casinos and numerous registered lobbyists. One of the firm’s tax lobbyists is Robert Armstrong, viewed as the state’s top trusts and estates attorney, and a manager of Rothschild Trust North America. The trust company was set up in 2013 to cater to international families, particularly those with a mix of assets and relatives in the U.S. and abroad, according to Rothschild. It caters to customers attracted to the “stable, regulated environment” of the U.S., said Rees, the Rothschild spokeswoman. “We do not offer legal structures to clients unless we are absolutely certain that their tax affairs are in order; both clients themselves and independent tax lawyers must actively confirm to us that this is the case,” Rees said. The managing director of the Nevada trust company is Scott Cripps, an amiable California tax attorney who used to run the trust services for Bank of the West, now part of French financial-services giant BNP Paribas SA. Cripps explained that moving money out of traditional offshore secrecy jurisdictions and into Nevada is a brisk new line of business for Rothschild. For decades, Switzerland has been the global capital of secret bank accounts. That may be changing. In 2007, UBS Group AG banker Bradley Birkenfeld blew the whistle on his firm helping U.S. clients evade taxes with undeclared accounts offshore. Swiss banks eventually paid a price. More than 80 Swiss banks, including UBS and Credit Suisse Group AG, have agreed to pay about $5 billion to the U.S. in penalties and fines. “I was surprised at how many were coming across that were formerly Swiss bank accounts, but they want out of Switzerland”Those firms also include Rothschild Bank AG, which last June entered into a nonprosecution agreement with the U.S. Department of Justice. The bank admitted helping U.S. clients hide income offshore from the Internal Revenue Service and agreed to pay an $11.5 million penalty and shut down nearly 300 accounts belonging to U.S. taxpayers, totaling $794 million in assets. The Treasury Department makes no apologies for not agreeing to the OECD standards. “The U.S. has led the charge in combating international tax evasion using offshore financial accounts,” said Treasury spokesman Ryan Daniels. He said the OECD initiative “builds directly” on the Fatca law. Firms aren’t wasting time to make the most of the current environment. Bolton Global Capital, a Boston-area financial advisory firm, recently circulated this hypothetical example in an e-mail: A wealthy Mexican opens a U.S. bank account using a company in the British Virgin Islands. As a result, only the company’s name would be sent to the BVI government, while the identity of the person owning the account would not be shared with Mexican authorities. The U.S. failure to sign onto the OECD information-sharing standard is “proving to be a strong driver of growth for our business,” wrote Bolton’s chief executive officer, Ray Grenier, in a marketing e-mail to bankers. His firm is seeing a spike in accounts moved out of European banks—“Switzerland in particular”—and into the U.S. The new OECD standard “was the beginning of the exodus,” he said in an interview. The U.S. Treasury is proposing standards similar to the OECD’s for foreign-held accounts in the U.S. But similar proposals in the past have stalled in the face of opposition from the Republican-controlled Congress and the banking industry. At issue is not just non-U.S. citizens skirting their home countries’ taxes. Treasury also is concerned that massive inflows of capital into secret accounts could become a new channel for criminal money laundering. At least $1.6 trillion in illicit funds are laundered through the global financial system each year, according to a United Nations estimate. Offering secrecy to clients is not against the law, but U.S. firms are not permitted to knowingly help overseas customers evade foreign taxes, said Scott Michel, a criminal tax defense attorney at Washington, D.C.-based Caplin & Drysdale who has represented Swiss banks and foreign account holders. “To the extent non-U.S. persons are encouraged to come to the U.S. for what may be our own ‘tax haven’ characteristics, the U.S. government would likely take a dim view of any marketing suggesting that evading home country tax is a legal objective,” he said. Rothschild says it takes “significant care” to ensure account holders’ assets are fully declared. The bank “adheres to the legal, regulatory, and tax rules wherever we operate,” said Rees, the Rothschild spokeswoman. Penney, who oversees the Reno business, is a longtime Rothschild lawyer who worked his way up from the firm’s trust operations in the tiny British isle of Guernsey. Penney, 56, is now a managing director based in London for Rothschild Wealth Management & Trust, which handles about $23 billion for 7,000 clients from offices including Milan, Zurich, and Hong Kong. A few years ago he was voted “Trustee of the Year” by an elite group of U.K. wealth advisers. In his September San Francisco talk, called “Using U.S. Trusts in International Planning: 10 Amazing Feats to Impress Clients and Colleagues,” Penney laid out legal ways to avoid both U.S. taxes and disclosures to clients’ home countries. In a section originally titled “U.S. Trusts to Preserve Privacy,” he included the hypothetical example of an Internet investor named “Wang, a Hong Kong resident,” originally from the People’s Republic of China, concerned that information about his wealth could be shared with Chinese authorities. Putting his assets into a Nevada LLC, in turn owned by a Nevada trust, would generate no U.S. tax returns, Penney wrote. Any forms the IRS would receive would result in “no meaningful information to exchange under” agreements between Hong Kong and the U.S., according to Penney’s PowerPoint presentation reviewed by Bloomberg. Penney offered a disclaimer: At least one government, the U.K., intends to make it a criminal offense for any U.K. firm to facilitate tax evasion. Rothschild said the PowerPoint was subsequently revised before Penney delivered his presentation. The firm provided what it said was the final version of the talk, which this time excluded several potentially controversial passages. Among them: the U.S. being the “biggest tax haven in the world,” the U.S.’s low appetite for enforcing other countries’ tax laws, and two references to “privacy” offered by the U.S. Since the end of 2014 a growing gap has developed between pro forma earnings and earnings based on Generally Accepted Accounting Practices (GAAP), according to figures from Factset and S&P Dow Jones Indices. Pro forma earnings for companies in the S&P 500 were 59% above GAAP earnings in the fourth quarter, compared to the end of 2014. For the year of 2015, pro forma earnings were $1.04 trillion, 32.5% more than the $787 billion of GAAP earnings. Pro forma earnings rose .4% in 2015, but GAAP earnings per share actually fell by -12.7%. The last time the spread between pro forma and GAAP earnings was this large was in 2001, 2002, and 2008, which weren't particularly great years for U.S. equities. Of the $256 billion difference between pro forma earnings and GAAP earnings, energy accounted for $93 billion, materials $43 billion, health care $43 billion, and $42 came from technology firms. The remaining $25 billion was spread out among the other 5 sectors of the S&P 500. Excluding energy, the gap between pro forma and GAAP earnings was 14%, the highest since 2008. Since 1985 the stock market has experienced declines of 20% or more whenever year-over-year corporate profits have been negative (1987, 1998, 2001, 2002, 2008, and now?). After-tax profits as a share of gross domestic income, a good proxy for economy-wide profit margins, were 7.5% in the fourth quarter. After tax profits peaked in the second quarter of 2013 at 10%. The 50-year average of employee compensation as a percent of gross domestic income is 55.8%. In 2015 it rose to 53.6% from 52.8% at the end of 2014. Despite the improvement in 2015 it is still 4% below the 50-year average. Given these statistics, one must wonder why the S&P has been able to hold up so well, and still only 3% from an all time high. Simple answer: Monetary policy intervention has never been so dominant a factor as it is now. Equity investors around the world have learned that when a central banker says "We're easing monetary policy even more", investors hear JUMP, and only ask "How high?" Based on pro forma earnings the S&P 500 is selling at modestly inflated P/E of 17.5, compared to 24 based on GAAP earnings. In addition to the shift to fuzzier accounting, financial engineering through corporate stock buybacks have also made the stock market appear less expensive than it is. Based on Warren Buffet's favorite valuation metric, stock market capitalization as a percent of GDP, the stock market is at the third most expensive level since 1900. (Chart compliments of Advisor Perspective and Doug Short at dshort.com.) In order for the U.S. stock market to appreciate from current levels, real GAAP earnings will have to grow in 2016, something they have not in the last three quarters.